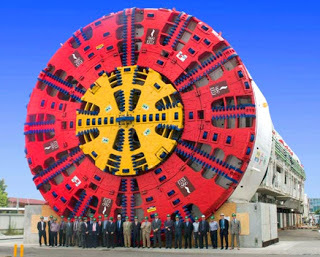 Metro's proposed F-7 Alternative Tunnel Project option for the 710 Freeway Project includes the construction of twin, 60-foot diameter tunnels, each with four lanes of traffic, stacked two-over-two, that will stretch underneath surrounding cities and neighborhoods for 4.5 miles between Alhambra and Pasadena. The freeway would be open to all vehicles without restrictions, except for a prohibition on hazardous materials in the tunnels. The LVAA Board of Directors recently voted to join with many other groups and individuals in Pasadena in opposing Metro’s F-7 Alternative Tunnel Project option for the 710 Freeway Project. Opposition to the tunnel is based on the project’s negative impacts, including the potential for an increase in air pollution and traffic congestion on local streets and in our neighborhoods, and public safety concerns. F-7 (freeway tunnel) – twin, 60-foot perimeter tunnels, each with four lanes of traffic, stacked two-over-two, that will stretch underneath surrounding cities and neighborhoods for 4.5 miles between Alhambra and Pasadena. This would fall within the corridor already owned by the State, generally following Pasadena Avenue to the existing freeway stubs (area near Huntington Hospital in Pasadena on the north, and area near Fremont Avenue and Valley Blvd. in Alhambra on the south). No build – the existing freeway, arterial and transit system, plus a series of system improvements that are already programmed in the Regional Transportation Improvement Program. None of these projects involve Pasadena. TSM/TDM – the existing transportation system, plus enhanced operations management and demand management activities. BRT 6 – a bus rapid transit alternative that in Pasadena would enter from the south on Fair Oaks, travel east on Colorado to Hill, south to California, west to Lake, and north to Colorado, and then retrace to Fair Oaks and exit at the City limit. LRT 4 – a light rail transit alternative that would enter Pasadena from the south through a tunnel under Fair Oaks Avenue and to an underground station adjacent to the Gold Line’s Fillmore Station near Arroyo Parkway and Fillmore Street. Metro plans to start a two-year environmental analysis of these options early next year. For opponents of any of these options, the fight continues. A primary goal stated by Metro is “to help alleviate congestion and improve mobility,” but Metro won’t say if they are talking about moving people, freight in trucks, both; we think it matters. Is the real purpose to move container traffic on trucks from the LA and Long Beach ports? Wouldn’t rail be a better way? Is it really a good idea to have twin, 4.5-mile tunnels with no vehicle exits under our city? Metro says that the tunnels would be open to all vehicles without restrictions, except for a prohibition on hazardous materials. Where would all car and truck pollution go? What would happen in the event of a tunnel fire or collapse? An earthquake? What about ground water impacts? How much of Pasadena would be affected? Experts consulted have stated that only a portion of exhaust pollutants can be removed with existing technology, and the amount removed decreases quickly if traffic is not moving smoothly. Would shuttling people under Pasadena, with no exit into Pasadena, impact Pasadena businesses? Significant segments of deep cut-and-cover transitional "tunnels" would be used for tunnel entry and exit points at both the south and north ends of the primary tunnels. Construction of these cut-and-cover tunnel entry/exit points will require a major effort to dig and haul dirt via trucks over a long period of time, thus increasing the potential for pollution in our neighborhoods, and city-wide traffic and noise impacts from the dirt removal efforts. What impacts will result from large, heavy trucks moving North ("up") and South ("down") through the primary and cut-and-cover tunnels at a generally 4% grade? How much more pollution, noise, and public safety risks will result? Could the money be better spent? Metro estimates the cost at $5 billion; other experts using comparisons from smaller tunnel projects (this project would be the largest in the U.S.) produce estimates of $12 to $25 billion. On February 27, 2013, the West Pasadena Residents Association (WPRA) sent a letter to METRO in anticipation of a SR-710 discussion during their February 28 Board meeting. The discussion did not take place, so no action was taken. Pasadena City Councilmember, Steve Madison, sent a letter to METRO Board Chairman, Mike Antonovich, offering to host an open forum with METRO representatives to share METRO’s position and intent, and to answer ongoing questions and concerns about the project from the community.